Synthetic peptide (10-30 amino acids in length) conjugated to KLH, from the N terminal of the first 100 amino acids of Human PIGK. 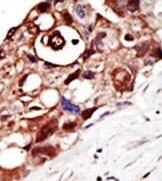 293 cell lysate, Human breast carcinoma tissue. This antibody was purified through a protein G column and eluted out with both high and low pH buffers. It was neutralized immediately after elution, followed by dialysis against PBS. Our Abpromise guarantee covers the use of ab38445 in the following tested applications. WB 1/100 - 1/500. Detects a band of approximately 45 kDa (predicted molecular weight: 45 kDa). PIGK is a member of the cysteine protease family C13 that is involved in glycosylphosphatidylinositol (GPI)-anchor biosynthesis. The GPI anchor is a glycolipid found on many blood cells and serves to anchor proteins to the cell surface. This protein is a member of the multisubunit enzyme, GPI transamidase and is thought to be its enzymatic component. GPI transamidase mediates GPI anchoring in the endoplasmic reticulum, by catalyzing the transfer of fully assembled GPI units to proteins. ab38445, at 1/50 dilution, staining PIGK in Human breast carcinoma by Immunohistochemistry, Formalin fixed and Paraffin embedded tissue. ab38445 was peroxidase-conjugated to the secondary antibody, followed by AEC staining. ab38445 has not yet been referenced specifically in any publications. Publishing research using ab38445? Please let us know so that we can cite the reference in this datasheet. There are currently no Customer reviews or Questions for ab38445.